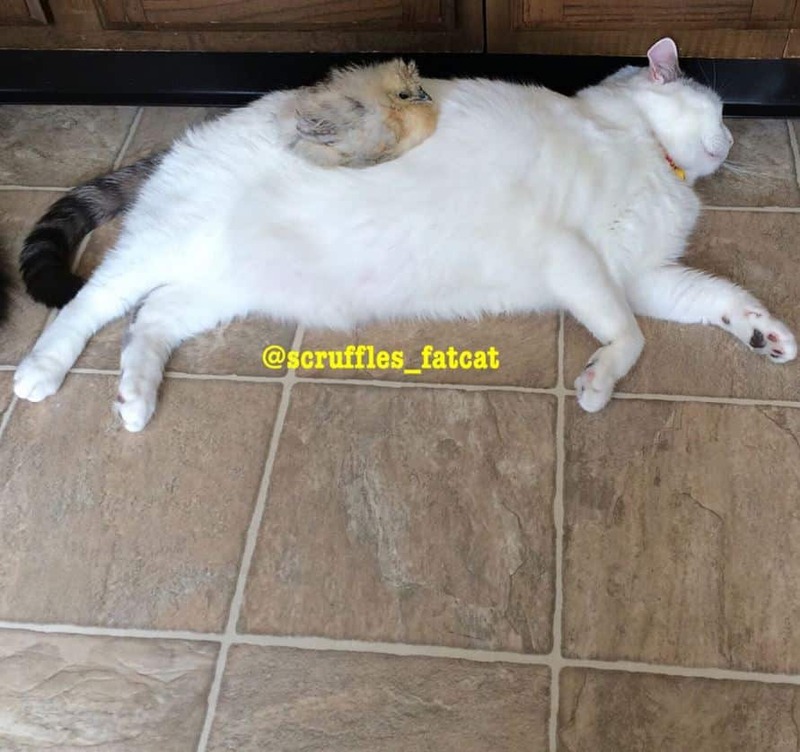 This chubby cat is named Scruffles and perhaps many of you might have heard of him. If not, you must take a look at these photos and see what he’s up to. 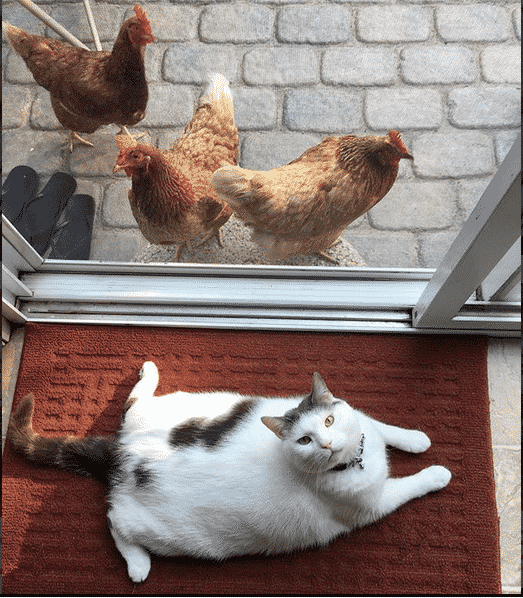 Scruffles is no ordinary cat because apparently not doing anything all day long makes the ‘chicks’ go crazy for him. And yes, we’re talking about real chicks – as in chickens! Scruffles is their muse and he does nothing else than pose for them in really weird positions. Check all these photos if you’re in for some good laughs! #15 and #10 are our favorites! 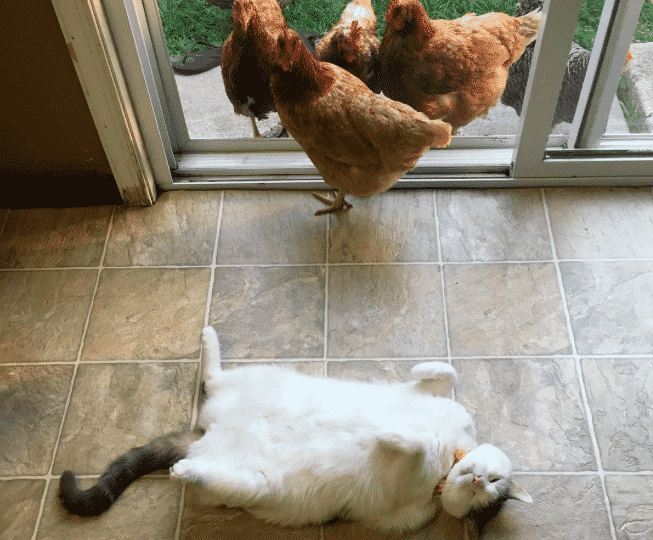 Scruffles just loves hanging out with his chicks. Considering that all they ever do is lay around the house, their owner decided to make them superstars! And we totally understand why the internet is going crazy after these photos became viral. 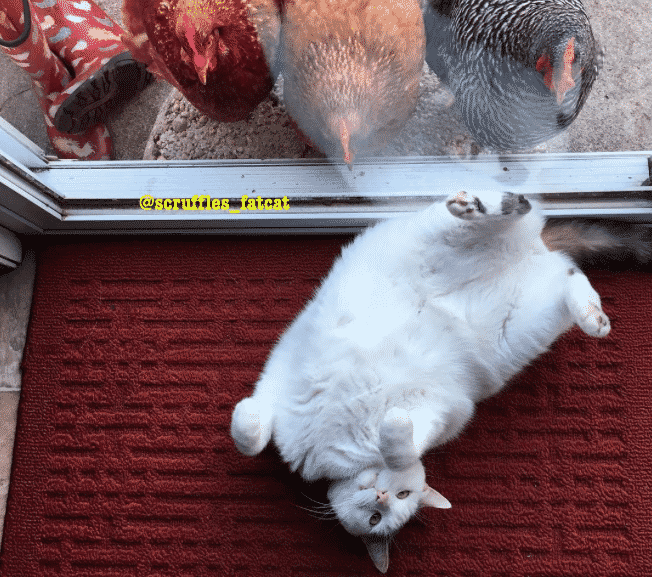 ‘Take a look at this adorable fluffy cat, chicks!’ Scruffles loves to lounge and either look at the chickens or let them watch him in his… splendor. 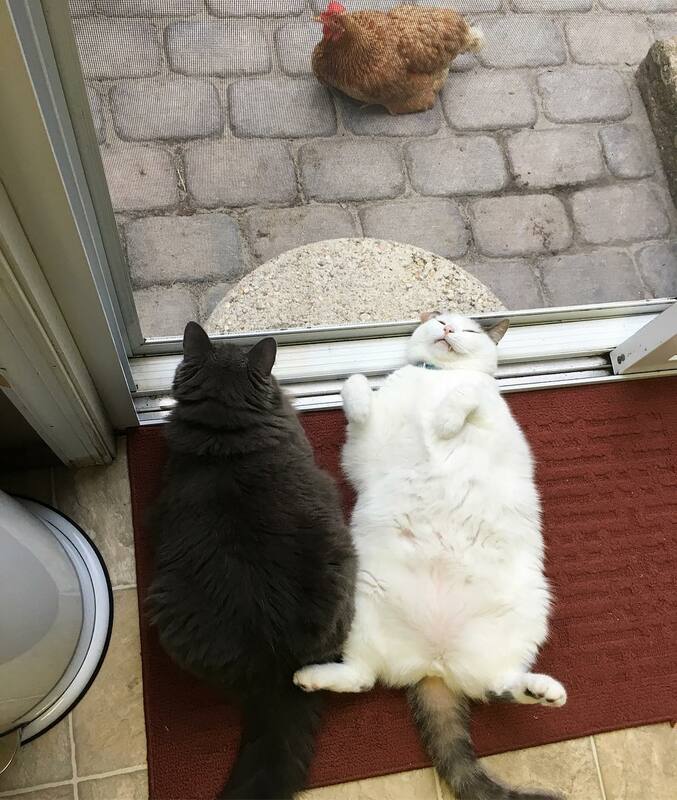 As you’re about to find out, the chubby cat has absolutely no shame! 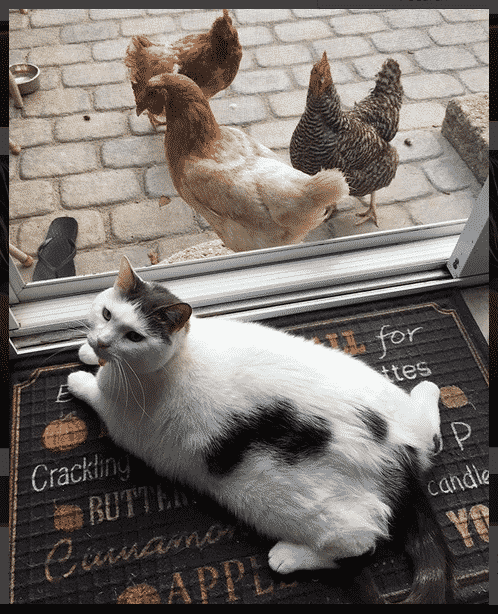 Scruffles has no problem staying with his pals, the chickens. He lets them walk around him and even get inside the house. 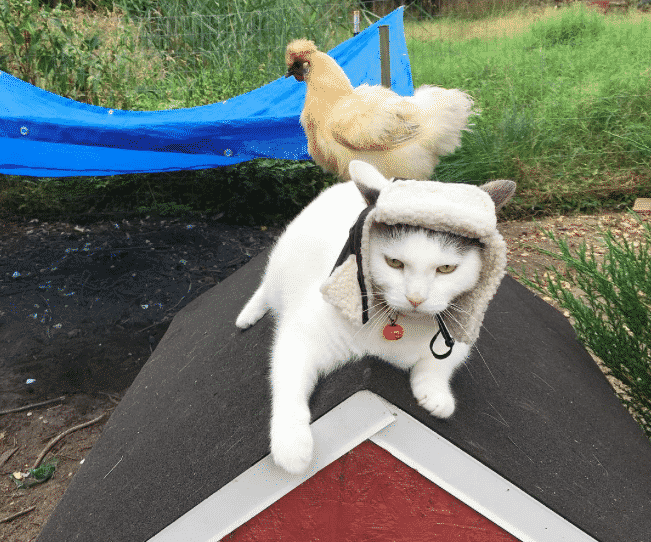 There are also small chicks that love to perch on his puffy fur. If you don’t believe us, take a look at #11! 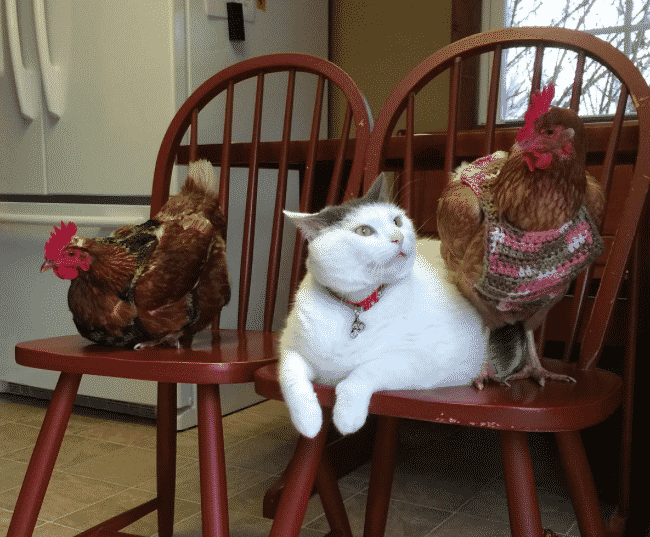 Scruffles loves his chicken friends and he especially loves the attention he gets from them. He also likes to share the bed with them! You won’t believe how cute they look in their pajamas! Take a look at #8 and see it for yourself. 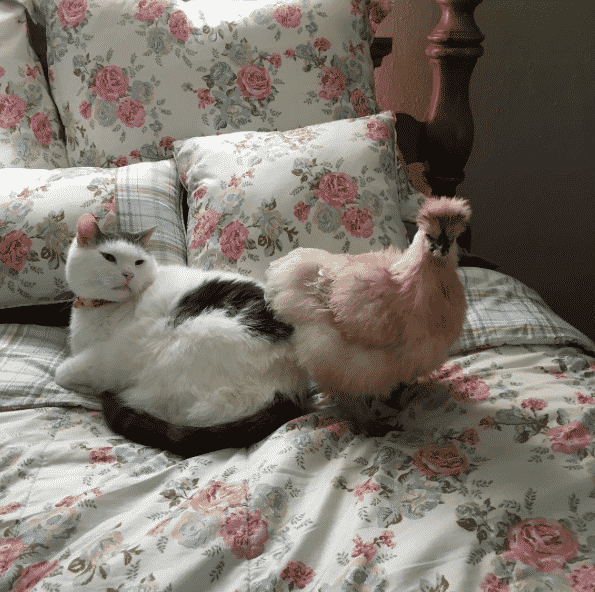 Scruffles has many feathered friends, small and big. And he loves them all. He also likes to play with them whenever he feels like moving around… He even has groupies, check them out in the next photo. They absolutely adore him! 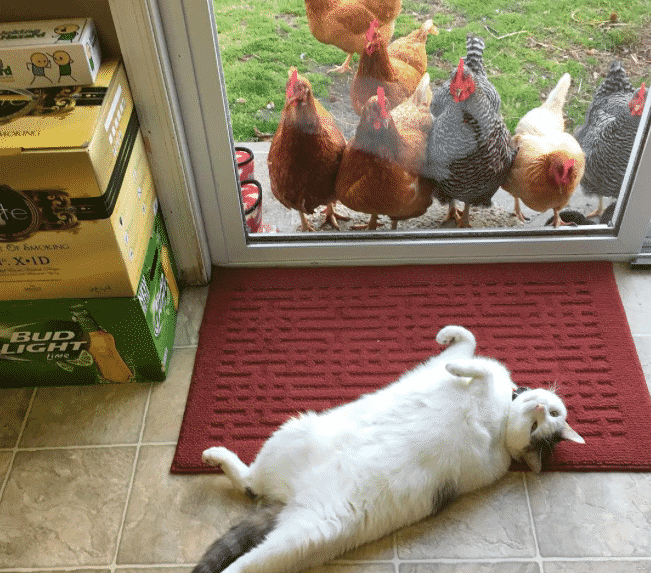 All the chickens are probably wondering what he does all day. He’s just sitting in front of the door and watching them closely. This is his favorite channel! If you thought that it couldn’t get cuter than this, you need to see #12 and #10. The chubby cat is ADORABLE! 19. Look, We Have Matching Colors! But the chickens are also following Scruffles closely! And they look like they’re planning something… See it for yourself! 18. 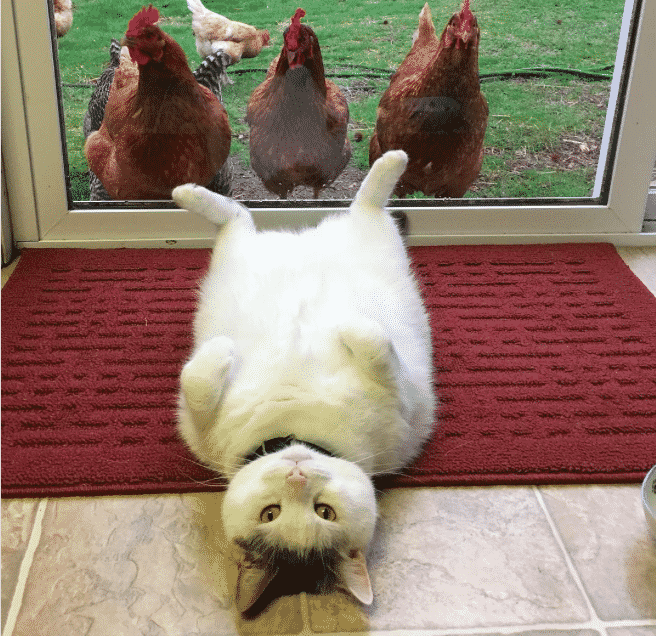 Dude, Since When Was the Chick Looking at Us? ‘Scruffles, don’t move! That chick is staring at you. I think she’s going to pounce on us.’ The ‘fatcat’, as the owners call him, has a lot of furry and feathery friends, and they all hang out together. Can you guess who’s his best friend? He is so chubby and puffy that the small chicks believe he’s their hen mother. He does provide warmth and purrs when needed! 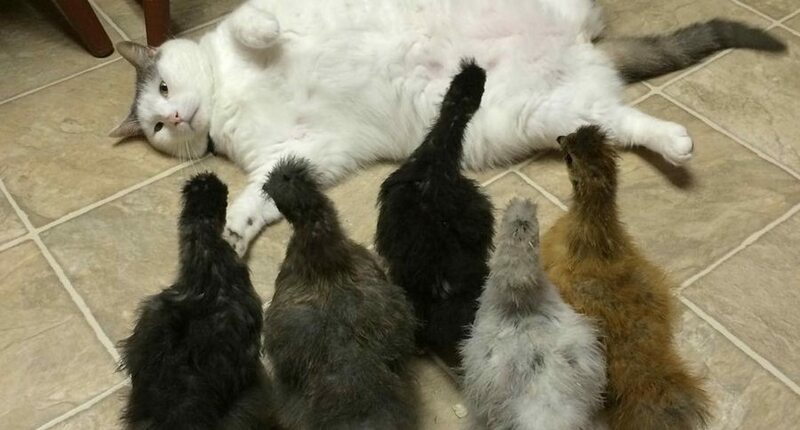 Now, do you get it why all chicks look up to him? He’s their meowm! But Scuffles also has other cat friends but they don’t share his passion, as you’re about to find out! 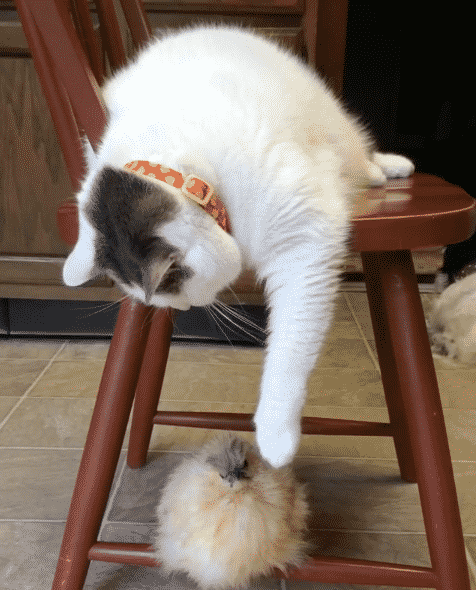 The chicks love Scruffles and cannot stop staring at the fluffy cat. And they apparently have nothing else to do than looking at all his moves and sleep positions. Can you guess what Scruffles wore for Halloween? 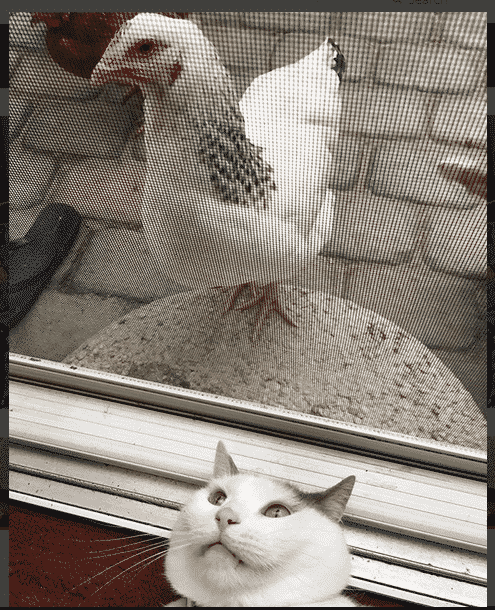 Scruffles also gets some outside… exercise by sitting in the backyard, surrounded by – YES, you guessed right! – all the chicks! Check out the Christmas photos at #6, #3 and #1. You’ll absolutely LOVE them! You can tell that Scruffles loves the attention. And when the chicks go to sleep, he has his fellow brothers to keep him company in the house. Talking about the house, look at his crib in the next photo! 13. You Call that a House? His brother, Momo, shares the same roof with Scruffles, but apparently, he got the short straw and gets to ‘enjoy’ the cardboard barn. 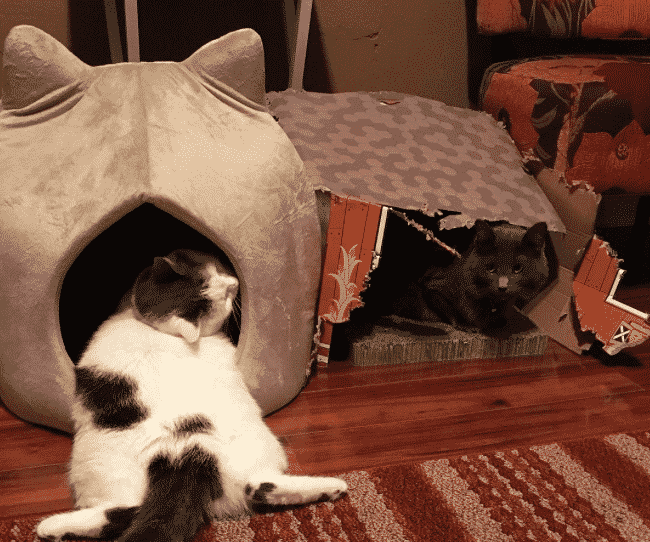 He could stay in Scruffles’ house, but let’s face it – looking at his round shaped brother, Momo knows they wouldn’t both fit inside. 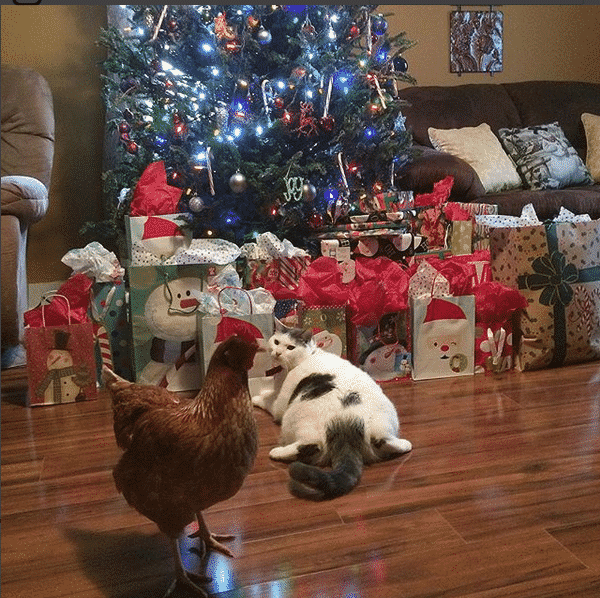 Here’s how they like to relax under the Christmas tree. ‘The chick looks untrustworthy, Mom sent it to spy on me!’ Moooom, why don’t you trust me? 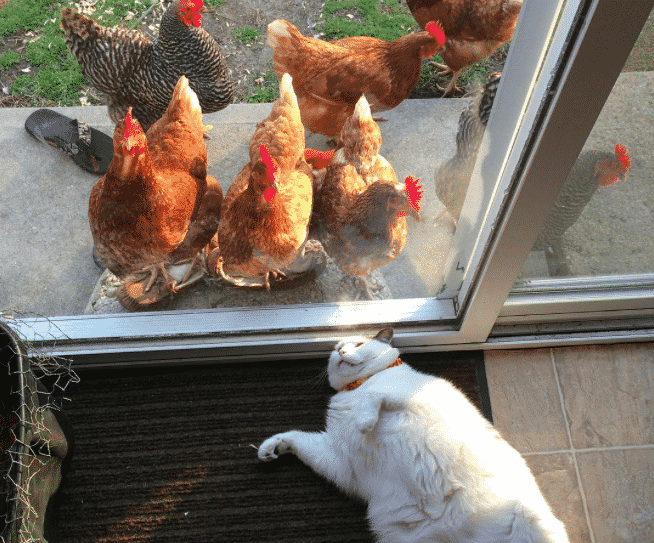 When Scruffles decides to take a break from staring out the window at his feathery friends, he mostly enjoys to… sleep. And his human mom never misses an opportunity and quickly takes out the camera. That chubby belly looks wonderful with those buttons, but the next photo is even more hilarious! There’s no wonder that Scruffles is such a huge celebrity. Who doesn’t like seeing a fat cat playing with a small toy? But anyway, the chickens are more interesting and Scruffles agrees with us. If you think that these photos are cute then you’ll definitely love the next ones! 9. Are These All the Toys? 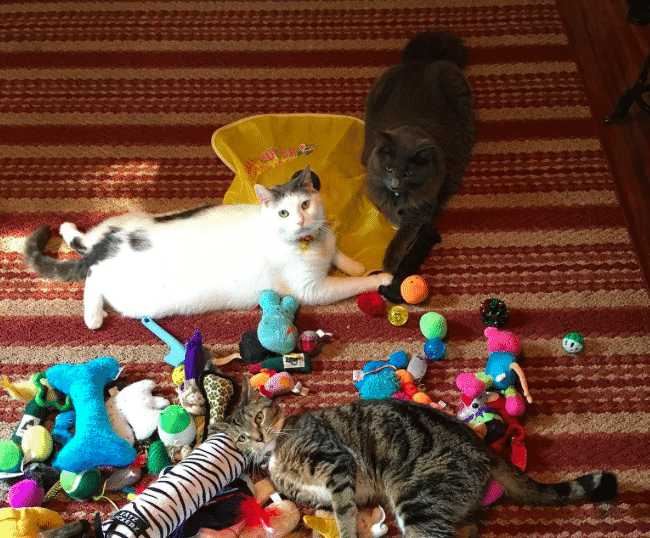 When Scruffles doesn’t stare at the chicks or sleeps with them, he gets to… lay around the toys and sort of play with his brothers. He is now mad at his brother who hogs half of the toys. But the cutest photo is still yet to come! Scruffles loves to put on a show when all his feathery friends are looking. That’s his favorite pastime and nothing makes him happier than that. Well, food is definitely among what makes him happy, but you get the point. 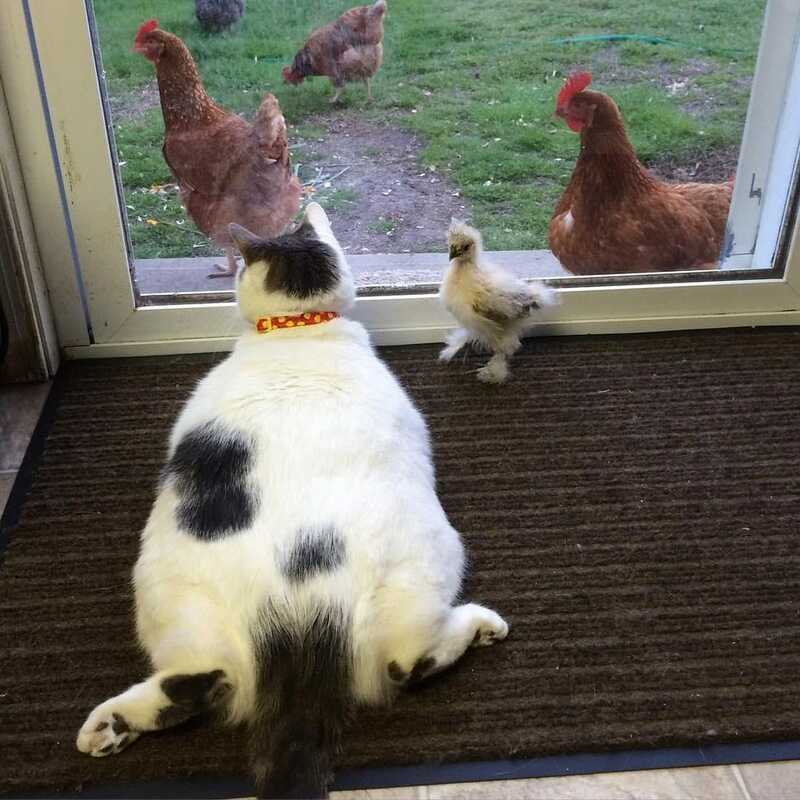 Instead of going out and chase them around, Scruffles just sits in front of the door and looks at the chicks. Check out the chicks attacking him in the next photo! ‘I’d rather play dead and let them trample me than get up and …run!’ If we had a spirit animal, Scruffles would be ours! Check out his funny position in the next photo. After playing for a few seconds, Scruffles decides that it’s time for a nap. Who need toys anyway? He has his chickens! 4. Just 5 More Minutes! You would think that he’s the one who destroyed that box, right? Well… let’s just say that Scruffle only enjoys sleeping on things rather than chewing on them. Curious to see his best friend? Check out the next photo! 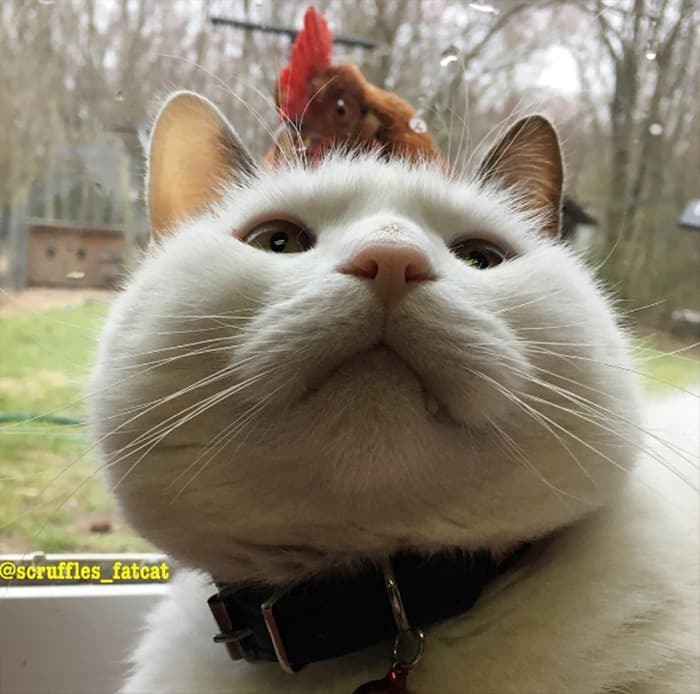 After getting bored of playing with the adults, Scruffles and his BFF run back into the house and search for his human mom’s phone to take selfies. We’re just kidding… but, are we? Come on, Scruffles! Go out and spread your legs, lose some of that roundness. ‘Do you mean like this?’ – plops down on the floor. 1. It’s Time for Another Nap! Scruffles loves his friends so much that he can’t even sleep without being close to them.